Figure 13. Arctic Heater Coolant Hoses. 19. Install new tiedown strap (Figure 12, Item 3) on saddle (Figure 12, Item 2) and hose (Figure 12, Item 1). Route hoses and install clamps and tiedown straps as noted during removal. 21. Install hose (Figure 1, Item 11) and clamp (Figure 1, Item 10) on arctic heater (Figure 13, Item 9). 22. Install new tiedown strap (Figure 13, Item 1) on saddle (Figure 13, Item 2) and hose (Figure 13, Item 3). 23. 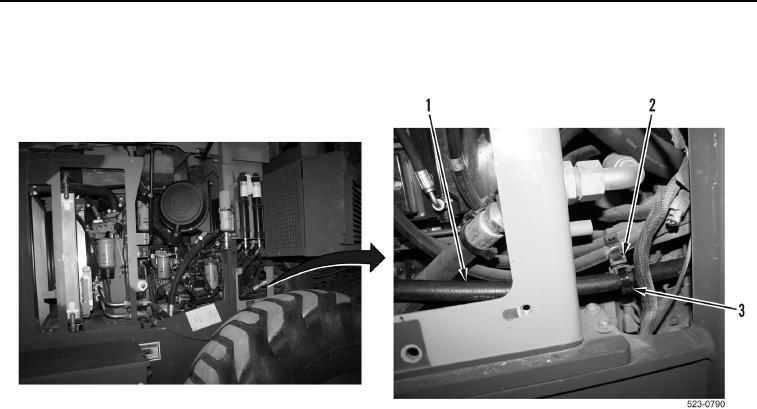 Install adapter (Figure 13, Item 5) on hose (Figure 1, Item 3). 24. Install hose (Figure 13, Item 7) and two clamps (Figure 13, Item 4) on adapter (Figure 13, Item 5). 25. Install new tiedown strap (Figure 13, Item 6) on hose (Figure 13, Item 7). 26. Install hose (Figure 13, Item 7) and clamp (Figure 13, Item 8) on arctic heater (Figure 13, Item 9).